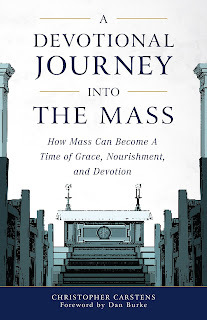 Book review: A Devotional Journey into the Mass - How Mass Can Become A Time of Grace, Nourishment, and Devotion, by Christopher Carstens (pub. Sophia Institute Press). “If you’re unhappy because the Mass has become for you routine – or even boring and tedious – these pages are for you. They teach you eight simple ways to make your every Mass a joyful time of piety and intense devotion.” This is how the publisher describes the appeal of this book. I would add to this that Carsten’s approach is the basis for a mystagogical catechesis that will allow us to participate, so that the Sacred Liturgy as a whole itself becomes the primary force for continual mystagogy. As such, I would see it as a natural complement to any authentic Catholic education, such as described in the book on children’s education I reviewed recently, Educating in Christ. 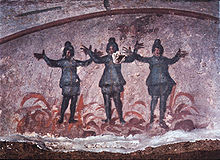 By emphasizing the sacramental nature of the Mass so profoundly and in such simple and clear language, and by showing its deep connection to Scripture and salvation history, it is, in my opinion, a foundational text for an approach to mystagogical catechesis that could reap rewards for a lifetime. I appreciated particularly, for example, his emphasis also on lectio divina as a preparation for the Scripture that is proclaimed in the readings at Mass. Firstly, he de-mystifies it with simple and clear instructions on the method. Secondly, and just as importantly, he highlights how this exercise in meditation and contemplative prayer is consummated in the worship of God. It is not a higher activity, but one which, like all other activities that are not liturgical, derives its power and effectiveness from the liturgy, and so, in turn, leads us back to it for its consummation. To help us, Carstens explains beautifully how our personal pilgrimages are a participation in that which takes place in the story of salvation history, running through Old and New Testaments. This is a useful point for the evangelization of New-Agers and non-Christians who are looking to Eastern religions in a search for mystery. I would say that their desire to meditate is good, but will be even more powerful and effective if transformed to be harmony with its true place in the spiritual life. I was gratified to read how strongly he makes the point that this is not just about the words. All art and even the architecture of the church building must reveal these universal truths in such a way that they are communicated to each person, and so act as clear perceptible signposts that direct us on our way. To the degree that we respond to what is offered, we can ourselves be formed as artists who then fashion our very lives to the template of the Paschal Mystery. My hope is to be formed as one of many such supernatural bridge-builders who are capable of forming an edifice that spans the divide between the liturgy and the culture of faith, and then, between the culture of faith and the wider culture; and further, that the cuture of faith can become a channel of divine beauty, bringing it from its source out into world, so that grace might be reflected in all human activity and every artefact that results from it. However, none of us can play a part in this if we don’t first come in from the dark, and “pass over”, so to speak, that bridge called the “Paschal mystery“ which connects us to the wellspring of grace and beauty, Christ present in the Eucharist. Christopher Carstens is the editor of the Adoremus Bulletin and one of the Liturgy Guys (along with Denis McNamara and Jesse Weiler) who create regular podcasts for the Liturgical Institute at Mundelein. He is also on the faculty of Pontifex University, for whom he has created an online class on the meaning of the Mass as part of the Master of Sacred Arts program.